Classic album from 1977, the sixth Kraftwerk album, originally issued by Kling Klang. This is the English-language, U.S.-cover art version. One of the inspired electronically-based pop records of all time. Performed by the quartet of Hütter, Schneider, Flür & Karl Bartos, this is the quintessential Kraftwerk sound recording experience. Tracklist: Side One: A1. Europe Endless; A2. The Hall Of Mirrors; A3. Showroom Dummies. Side Two: B1. 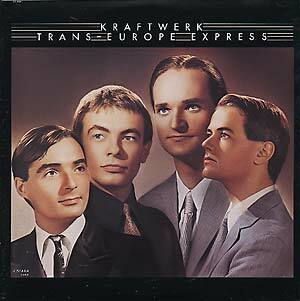 Trans-Europe Express; B2. Metal On Metal; B3. Franz Schubert; B4. Endless Endless.